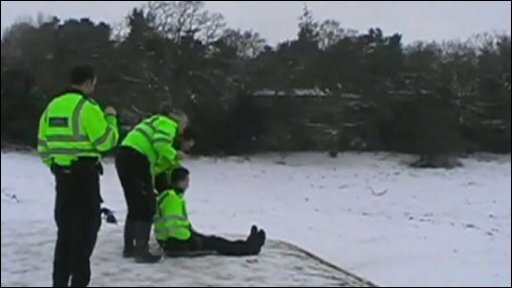 Thames Valley Police officers were filmed using riot shields to sledge down a snowy hill while on duty. Rick Latham filmed the officers on Boars Hill, Oxford, and posted it on YouTube. Local policing area commander Supt Andrew Murray said the snow had "a habit of bringing out the child in all of us". He added: "I have spoken to the officers concerned and reminded them in no uncertain terms that tobogganing on duty, on police equipment and at taxpayers' expense is a very bad idea should they wish to progress under my command."